From seasonal sips to legendary happy hours, Dallas restaurants and bars are focusing their efforts on some really impressive libations. Here is a rundown of some drinks we think you should try. The funky, fast-casual restaurant known for creating tacos with international flavors has introduced a blood orange sage margarita, available through Jan. 6. The drink begins with Velvet Taco’s original margarita that’s then topped with a seasonal homemade blood orange sage puree and garnished with a fried sage leaf. The drink is made in-house daily using fresh fruit and available at all locations. Launched by an SMU undergrad, the West Village eatery now has a social hour. From 4 to 6 p.m. daily, the restaurant will serve a selection of handrolls, sashimi, and drinks. The social hour also has introduced Namo’s first-ever cocktail, the Tokyo Toddy, which incorporates Namo’s nitro-green tea and TKYU sake with a splash of local raw honey and garnished with lemon. Known for their diverse take on contemporary American favorites, Kona Grill has unveiled a bigger and better happy hour, which will include a wide variety of menu items and 20 cocktails and wine offerings available for $5. Their popular house margarita will also be returning and will be available for $1 from 4 to 5 p.m. Monday through Friday. Happy hour drinks also include the London mule, bloody Mary, and sake sangria. As the seasons continue to shift, this eatery is showcasing its fishbowl, which combines Deep Eddy orange vodka, Gekkeikan sake, Soho lychee liqueur, strawberry puree, fresh lemon juice, and ginger beer. (As a side note to our fellow vegans and vegetarians, Blue Sushi Sake Grill also offers an incredible list of vegan and vegetarian rolls that are guaranteed to please. Our favorites include The Cowgirl (rolled in BBQ paper) and the Shitake to Me, which has mushrooms soaked in coconut milk! Blue Sushi Sake Grill also has an Uptown location. And, if you just want to stay home and be your own mixologist, Blue Sushi Sake Grill has provided our readers with the recipe for its Perfect Bloody Mary – cheers! 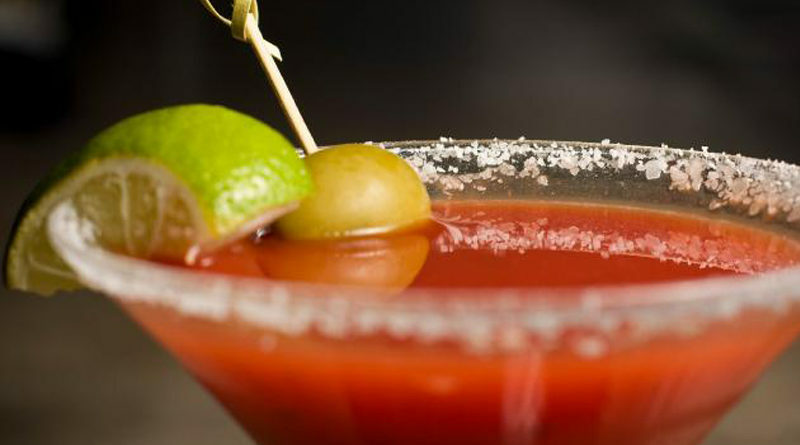 Add ice, vodka, Bloody Mary mix, ponzu and a splash of Sriracha to your shaker. Shake well. Top it off with a green olive, and a fresh lime wheel.